Welcome to the second part of your two for one deal as I look back at what the rest of this week's TV had to offer. First up we have the return of ITV's superior crime drama Scott and Bailey. This first episode of series three is set six months after the events of series two which I initially found fairly confusing. For example Rachel Bailey (Suranne Jones) is now married to dull PC Sean (Sean Maguire) as well as being back in contact with her mother (Tracie Bennett). Meanwhile Janet Scott (Lesley Sharp) is now divorced but still living with her ex-husband until they can find a buyer for their house. The detectives' first case this series involves the death of Eunice Bevan whose decapitated head is found at the bottom of her staircase. It is soon revealed that she was struck over the head by an unknown assailant while her head was later separated from her body by her dog. Stranger still, her bed-ridden husband Joe was in the house the entire time and is found alive when the police break into the Bevan residence. While a dehydrated Joe is taken to hospital, Rachel attempts to track down the couple's daughter Helen (Nicola Walker). The police eventually interview Helen at work but she tells them that she hasn't seen either of her parents since she was fifteen. As more skeletons begin to fly out of the Bevan family closet it appears as if the murderer might not be who we think it is. Meanwhile there's more trouble for our heroines when Janet discovers her ex has a new girlfriend and Rachel wants to escape from her boring husband. To me Scott and Bailey is one of the best crime shows on TV and that is mainly due to its realistic nature. Part of this realism is down to the fact that Lesley Sharp and Suranne Jones have such great chemistry as the titular detectives. Sharp and Jones balance each other well with the former being the more dependable member of the pair and the other being slightly more unsure of herself. Sally Wainwright's dialogue is also a joy to hear and once again she scripts the series incredibly. I felt that this week's central case was well-built with motives and evidence building up as the episode progressed. 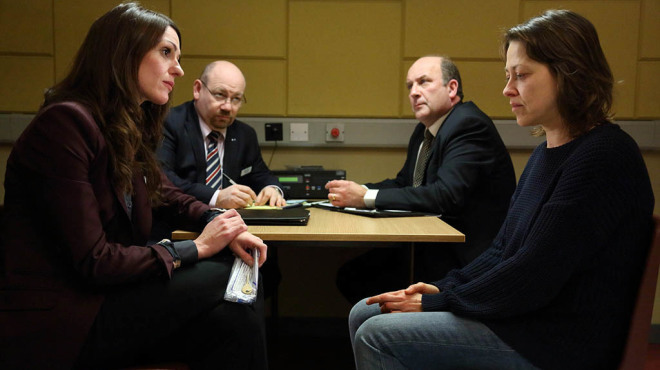 The presence of Nicola Walker as Helen also helped the episode massively as the scenes featuring herself and Rachel were the episode's best. My only disappointment was that there wasn't more of the brilliant Amelia Bullmore as the pair's DI but judging by that opening scene she has a fairly prominent story on the horizon. As I already mentioned this episode felt a little jarring as we completely missed Rachel getting married and meeting her mother. Thankfully those events will be covered in next week's episode which I have to say I'm looking forward to. Overall Scott and Bailey is just as good as it's always been thanks to its well-written script and its brilliant leading ladies. Obviously with The Great British Bake-Off being such a success it was inevitable that spin-offs of the original would begin to appear. The first, and hopefully last, of these is The Great British Sewing Bee a programme in which Claudia Winkleman attempts to find the nation's best amateur sewer. The programme essentially invited eight sewers to a haberdashery and made them compete in a series of fashion-related challenges. The contestants were a colourful bunch including 81 year old yoga-loving Ann, camp fitness instructor Stuart and Jane who makes her own clothes and drives a sports car. My favourite contestant was HGV mechanic Mark who makes 18th century costumes for his family to wear when they attend Steam Punk events. Bearded Mark really had trouble with the first challenge in which the sewers had to make an A-Line skirt mainly because he'd never fitted a zip to anything in his life. Meanwhile Claudia had to build up the tension with lines such as 'are you going to have time to line your skirt?' 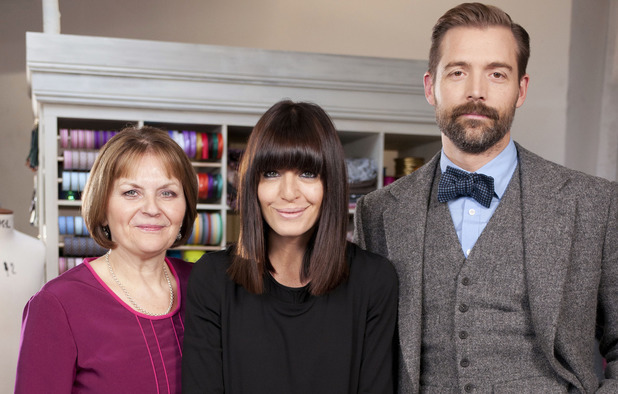 The Paul Holywood and Mary Berry element of this programme is provided by Saville Row tailor Patrick Grant and WI stalwart May Martin. I found that Martin and Grant were one aspect of the show that didn't really work mainly because neither have a natural TV presence. While I'm not questioning their qualifications they both seemed to be playing the nasty judge role and neither had any really charisma.Thankfully there was plenty of personality available in the contestants who were what made this programme stand out and were a joy to watch throughout. The main issue for me though was that sewing isn't as universal a pastime as baking. Whereas all of us have at least eaten a cake, if not attempted to make one ourselves, we've not all been near a sewing machine. Therefore it's hard for me to sit and judge at home the technical aspects of the stitching on a skirt when I've got no idea what it's meant to look like. I think if you're a sewer, or maybe someone who enjoys fashion, then you'll get pleasure from The Great British Sewing Bee. However I don't feel it has that same universal crossover that the Bake-Off did and ultimately I think this series is destined to be a one-hit wonder. When Hilary Devey first appeared on Dragon's Den she came across as a natural TV personality and someone who was destined for bigger things. And indeed after just two series of the BBC show she signed a deal with Channel 4 and is now fronting her first programme entitled The Intern. The premise of the show sees Hilary meeting some of the UK's young unemployed and trying to get them jobs with some of the nation's most prestigious employers. The first episode saw her join forces with hotel chain The Red Carnation Collection in an attempt to get one of her interns on their management training scheme. The interns spend a week working at one of the group's hotels and during that time Hilary sets up a number of hidden camera-style tests. Feisty graduate Princess was the first to be put through her paces by discovering Made in Chelsea's Hugo Taylor tied to a bedpost while she was doing her housekeeping rounds. Despite telling her to be discreet, Princess ended up telling the entire staff which resulted in her getting a telling off from Hilary. Princess later redeemed herself when she successfully dealt with a group of rowdy guests who were unimpressed when their rooms weren't ready. Cafe worker Taelre also had some issues when he accidentally got one of the guests' cars crushed but eventually was able to arrange a replacement. Taelre later stumbled on his second task when he had to deal with a catastrophe involving a cake that a man needed in order to propose to his girlfriend. Finally single mum Georgia had to deal with a missing dog before tackling a bigger challenge when a wife burst into a room to confront her cheating husband. I personally found The Intern to be an odd mix of Beadle's About and The Apprentice. While I do appreciate that it was trying to do an admirable thing in getting youngsters back to work I felt it went about it the wrong way. The whole hidden camera idea has been done to death and some of the situations these recruits found themselves in were just plain ridiculous. However the main problem is that Hilary Devey isn't in it nearly enough as should be seeing as she's the main draw here. Her basic role is to dish out a little bit of advice to her interns but ultimately it's all about the kids and the hotel staff. I believe that there is a programme that would suit Hilary's many talents but I'm afraid that The Intern just isn't it. We end with a bit of comedy as Friday night saw the return of Not Going Out for its sixth series. The big difference this time around is that Tim Vine has now left meaning that Lee Mack has no comic foil. Tim's disappearance was explained early on in this episode as he is apparently on a work placement in Germany. Meanwhile Tim's sister Lucy (Sally Breton) had a dilemma when she ran over the rabbit of a client's daughter after a successful business meeting. As this was Not Going Out, Lucy did the most illogical thing namely to get Lee to return the body of the rabbit to its owner. However due to a number of misunderstandings, Lee ends up returning the wrong rabbit and so the usual string of comic capers begin. To be fair not much has changed in the world of Not Going Out and I have to say I really didn't miss Tim Vine all that much. I feel by this point Mack and Breton to have enough chemistry to carry a sitcom together and this episode really demonstrated it. Thankfully Katy Wix's Daisy is still around and in this first episode had some great one-liners though I'd like to see her be the focus of a few more storylines now she's one of the major players. Not Going Out may not be the most original comedy around but there's no denying that it's still funny after six years. Mack knows how to both write and deliver a funny line while his two female co-stars are also excellent at bouncing of him. So far 2013 has been a dire year for UK sitcoms so I'm glad that there's finally something on TV that at least makes me laugh once in a while.